Inspector’s Tool Bag | Sure Sight Home Inspection, Inc. The only tools required to perform a home inspection to meet the standards of practice in North Carolina are a flashlight and screwdriver. While some home inspectors settle for meeting the minimum standard, Sure Sight Home Inspection uses the latest in diagnostic tools to ensure that the homes we inspect are safe and in good repair. 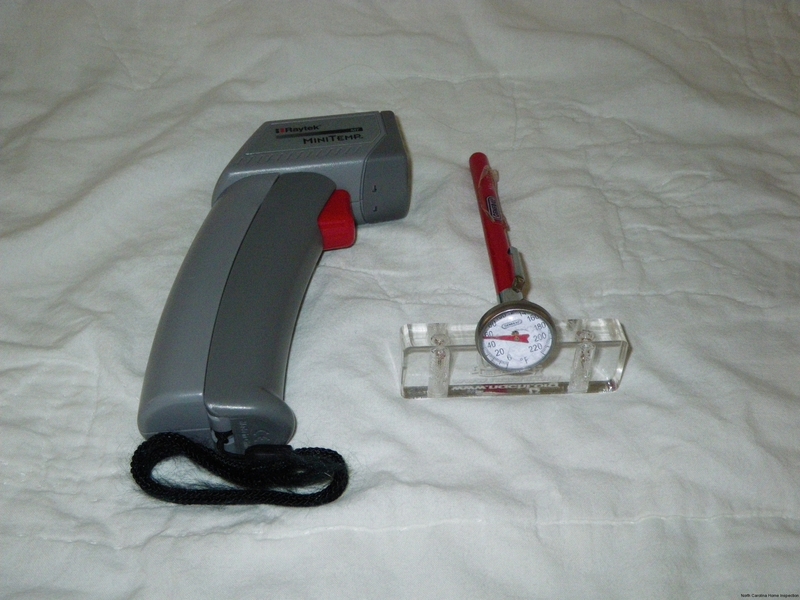 Nothing complements your inspector’s knowledge quite like a good moisture meter or electrical tester. Check out our arsenal of diagnostic equipment and feel free to compare it to the competition. What's so special about a thermometer? Would you prefer that your home inspector test your air conditioner and furnace by placing a hand over the vent and feeling if it's cool or warm? Or would you like your inspector to measure the temperature differentials between the supply and return air to determine if they are within the proper range? Unfortunately, many inspectors out there still choose the hand method because they believe that the thermometer method is "too technical." Stay away from these types of inspectors unless a rock-bottom price on a home inspection is your only priority.